Avoid uneaten school lunches by involving the kids in the menu planning. 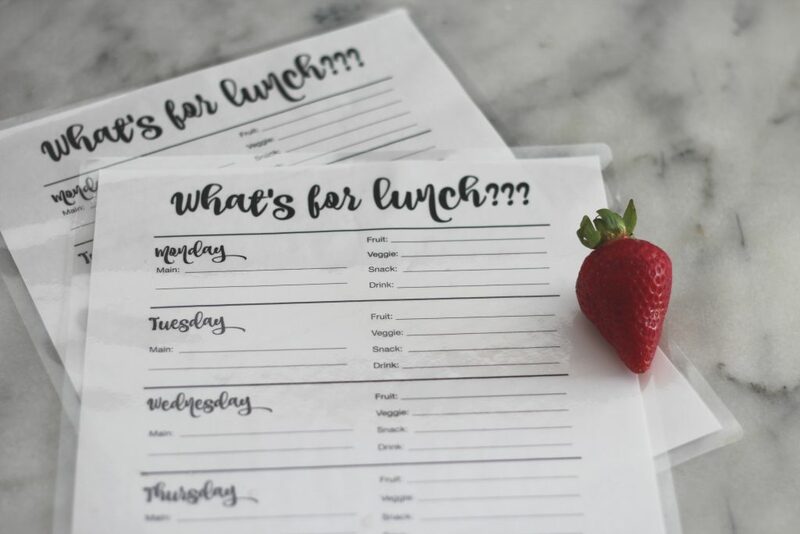 Use this free printable lunch schedule to help you and the kids plan their lunches! My older kiddos went back to school this week and one of the in our home is lunches. I love food. I love cooking it and I love eating it. I don’t mind making the kids lunches in the mornings, but what I do mind is opening up a unicorn lunch box in the morning and finding uneaten food from the day (or days) before. In order to decrease my frustrations and make sure that they eat a nutritious lunch, the kids and I decided that we would create a weekly lunch plan. Over the weekend, they fill out the printable lunch schedule saying what they want for each day of the school week. They know that they have to have something with protein, a fruit and vegetable and a snack. The drink is always water, in their reusable water bottles that they can fill up at school. I like having the lists made up so that I know what to shop for ahead of time and can switch up their lunches so that they don’t get bored with their food. One kid wants a SunButter and raspberry jelly sandwich everyday, the other wants something different each day of the week. Basically, this lunch schedule is like a contract between the kids and myself. So far they have eaten the majority of their lunches and not one complaint. Granted, we are still in the first week of school, so we shall see. I laminated the lists and the kids used dry erase markers to fill it out, so that it can be reused each week. It lives on the refrigerator so that I can get a quick glance when I make lunches in the mornings! 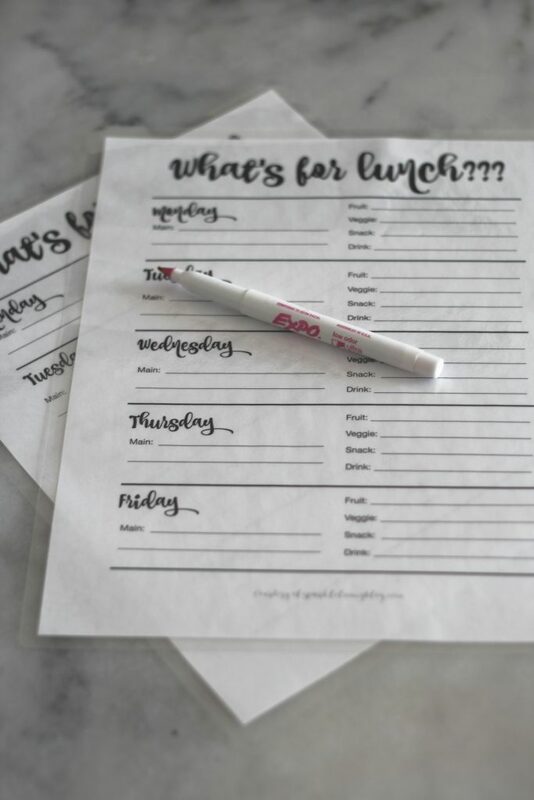 Do you want a free printable lunch schedule of your own? Great! Sign up below to be a subscriber and one will be sent to your email! This is such a great idea! My little one isn’t school aged yet, but I will definitely keep this in mind for when she is. I am thrilled by how well it is working and what the kids are learning about proper nutrition! What an awesome idea! Once my boys are able to write I’ll have to try this with them. They love to help put their lunches together before school. This is a great idea! I love including the kids in chores, so including them in meal planning is perfect. If it cuts down on food waste, too then it’s even better. I should definitely print these out for my kids. They have been known to pack themselves bags of sprinkles. 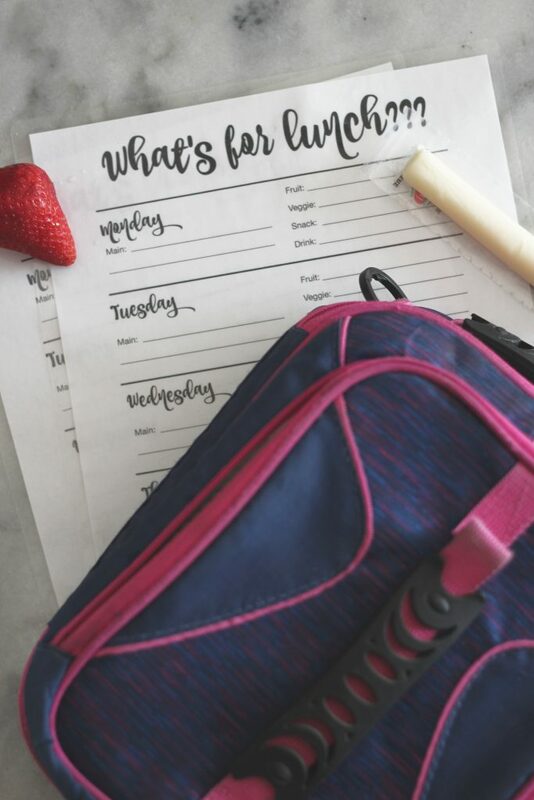 This printable lunch schedule is absolute perfection! I have been looking for something like this for a while now! That is a fascinating idea! I’m not sure if it would work for my kids, partly because they often get leftovers from dinner if they liked dinner haha (esp. when it’s homemade mac’n’cheese night!) – I try to get compliance by having them make their own lunches on occasion, though, which seems to work! What an awesome idea! I love that you include lines for fruit and veggies. Kind of sets a standard so that the kiddos know what’s coming and how to eat well! This is a great idea for planning lunches for back to school. Thanks for the free printables. This is a great idea! Will definitely be printing this out to help me plan lunch a little better! This is such a great idea. I need to do this for my son, he is notorious for not eating his lunch. I think this is a great way to help teach children and also have them eat packed home lunch! Such a great idea! So into this. I absolutely love printables, meal planning, and organization. This is perfect especially for back to school. Wow, that is a great idea. No wasted food either! Great idea to help you be organized for school! Thanks for sharing with SYC.